Get started Start Your Purchase Agreement Answer some questions. We’ll take care of the rest. You should use a purchase agreement if your own personal property (property other than real estate or a vehicle) will be sold or transferred to another party. It is also helpful when you plan to buy personal property from a third party and want to have more documentation than a cancelled check. 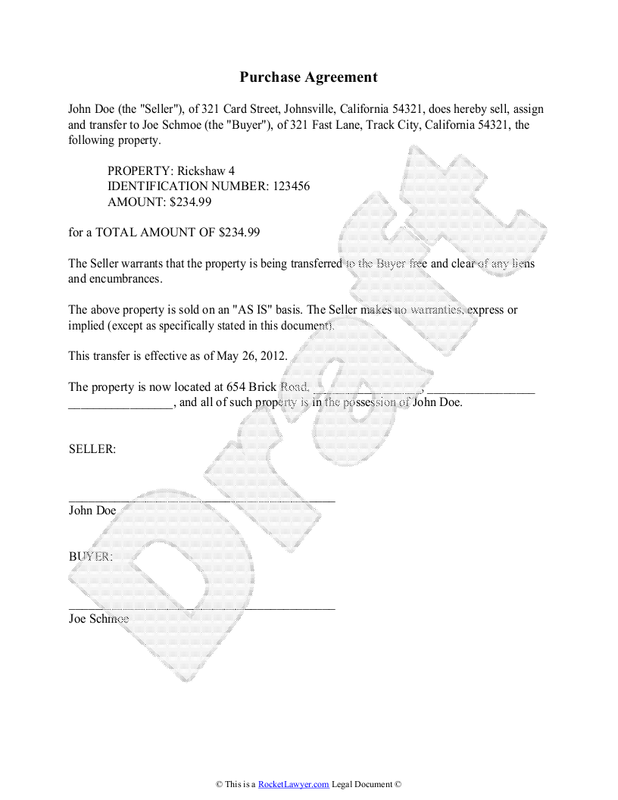 In the sample purchase agreement below, John Doe transfers his rickshaw to Joe Schmoe. Sample purchase agreement. To create your own personalized purchase agreement, click on the image above. No matter what asset you're trying to sell---be it a car, musical instrument, pet, or even a lease---most purchase agreements look similar to this purchase agreement template. Rocket Lawyer makes it simple for your to create a purchase agreement. Want to get started? Simply click on the link below to start your personalized purchase agreement. You can also browse our help articles for more legal information, such as How to Buy or Rent Office Space for Your Business, How to Apply for an Employer Identification Number (EIN - SS4) Online, and Get Free Legal Help with Business Formation and Starting a Business.